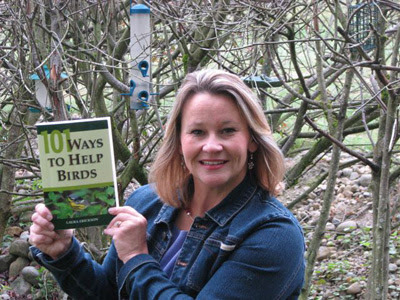 Of the baker’s dozen books I’ve written in the past quarter century, I think the most important is my 101 Ways to Help Birds, which was published by Stackpole in 2006. It took over two years to write it—I started it right after the Midwest Birding Symposium in September 2003, after spending the weekend energized and inspired by a host of prominent conservationists I’d been meeting with, such as Alicia Craig, Kenn Kaufman, Don and Lillian Stokes, Ron Windingstad, and Ric Zarwell. On the drive home, I was suddenly struck by the fact that I didn’t know of any book that thoroughly covered the broad span of threats birds face from every direction, and what we individually can do to help. 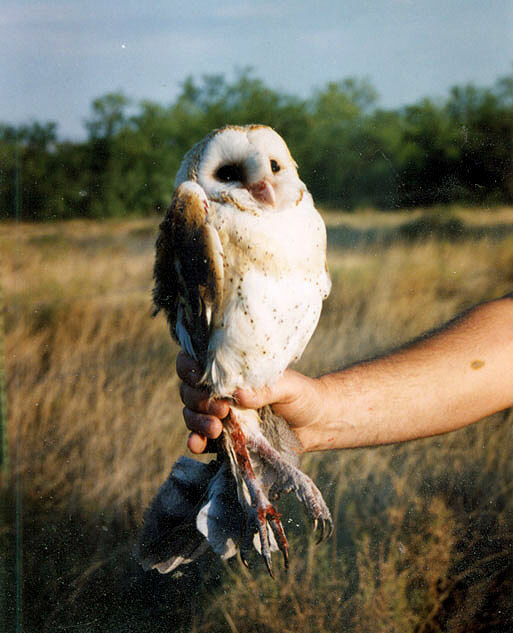 As I researched how these issues—from conserving water and energy to removing unnecessary fencing—affect bird populations, I felt increasingly depressed and hopeless. It didn’t help that the book was rejected by a few major publishers that have long specialized in titles important for birders, including Houghton Mifflin, the original publisher of Silent Spring. I didn’t get any negative feedback about the content or my approach—indeed, the bird book acquisitions editor at one major publisher wrote me a personal letter about how much he loved the book and how much he wanted them to publish it, but he said the publishers decided there was no market for books about bird conservation. And every publisher said the implied reference to Rachel Carson in my title would have to go: as we were approaching the 2007 centennial of her birth, a groundswell of negative publicity against her and for a return to the widespread use of DDT made publishers nervous. Ironically, Rodale, the publisher of Al Gore’s book about climate change, rejected the book out-of-hand not because it was about conservation but because it didn’t go far enough, at least with regard to pesticides. I thoroughly explain how dangerous insecticides, herbicides, fungicides, and rodenticides are for birds and why it’s best to avoid them entirely, but I tried to be flexible to reach as many people as possible, noting that if someone were absolutely committed to a pristine lawn, it would be better to spot spray dandelions than to hire a lawn care company to apply herbicides over every square inch of lawn, even where no dandelions could be found. If Rodale thought I was not preachy enough, a couple of prominent conservationists thought I was too preachy and negative. 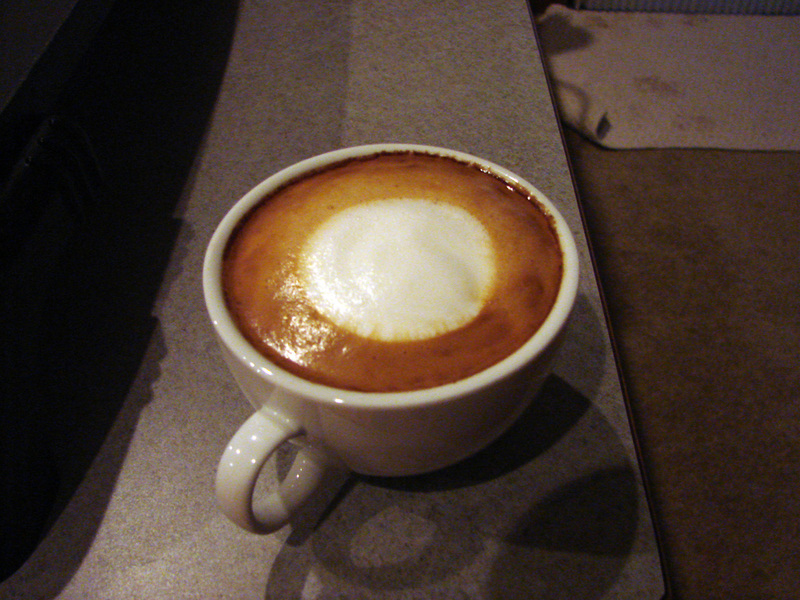 All I could do was follow my own lights and make my work as good as I could. It would be lovely if other conservationists would write better books that cover these issues—I’d welcome seeing my stuff replaced by better work. I also wish conservation books sold as well as field guides, and that we had as broad a selection of them. I’d have loved to have this book put out by a major publisher with a budget to produce it as I originally envisioned it, filled with colorful photos and other useful illustrations. A picture is worth a thousand words, especially in a how-to book—it was frustrating to be limited to written explanations. 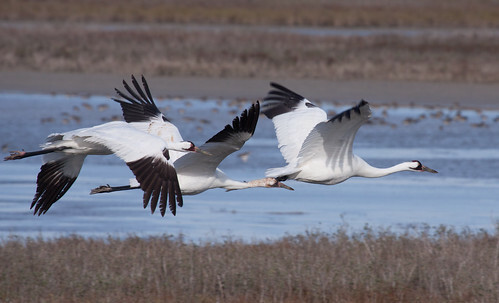 And beautiful pictures of birds can provide visceral evidence of what is at stake. As it turned out, the 284-page book has fewer than 50 black-and-white line drawings—not many people nowadays would consider buying such a text-heavy bird book. But Stackpole did a great job of editing and keeping my message intact, and based on what the other publishers said, Stackpole took a huge financial risk to publish the book at all, for which I’m very grateful. 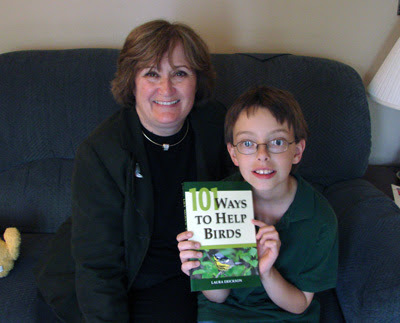 101 Ways to Help Birds is still in print and easily purchased online. A handful of bookstores, especially associated with national wildlife refuge associations and other conservation organizations, make a point of keeping it in stock. I usually have copies of this and my other books along when I do presentations, but I’m not very likely to tell people about that—I’m a horrible salesperson. But I wrote the book to help birds, and want the information “out there” however I can do it. 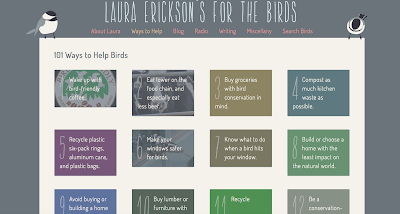 All 101 ways are listed on my webpage (and this blog) at the top under “Ways to Help.” Last week I transcribed the entire entry about making windows safe for birds to my webpage in conjunction with my blog post I wrote about windows. Then Environment for the Americas, which sponsors International Migratory Bird Day, linked to it on facebook. That made me realize that I should do that for all 101 ways, so now I’m transcribing the rest of the book’s text there, too. The “ways” are listed in separate boxes. Any of those boxes that have a photo background can be clicked now to see the entire text from the book and also photos. Unfortunately, I can’t find any digital copies of the book, so I’m typing out the entire text entry by entry, which is time-consuming. But I’m noticing that even though the book is over 10 years old now, most of the information is still accurate. After I’ve finished adding all the entries, I’ll start adding updated information and resources. If you know of any sources you’d like me to include, please let me know. I'm going to find your book at the Seattle Audubon Nature Shop--thank you for sharing it here! Thank you so much! I put my heart and soul and 2 1/2 years into this book, and no one has written anything this comprehensive since. We need to prove to publishers that there is a market for conservation books to get better, more current works like this published.